Colorado Guided river wading trips have historically been the most popular way for our guests to experience guided fly fishing here in the Roaring Fork Valley. Aspen Flyfishing guides take pride in their ability to provide an exceptional experience for veteran fly-fisherman, as well as for our guests who are first-timers to our peaceful pursuit. Guided wade trips give you the opportunity to really work a piece of water and use all of your senses to target and land specific fish. The Aspen fly fishing guides are the best in the business and highly experienced on the rivers we fish. Give us a call for the most memorable fly fishing trip around. 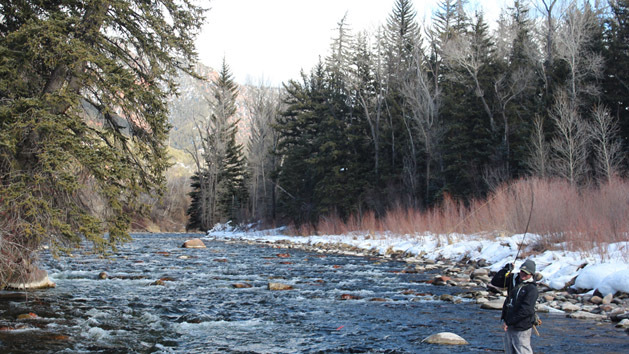 We are conveniently located in Aspen, Colorado for all of your fly fishing needs.